the last few weeks having been so wet the grass everywhere is positively glowing green, and in the warm afternoon light everything looks vivid and springlike. Tilda has spent the day outside in the warm air and sun. 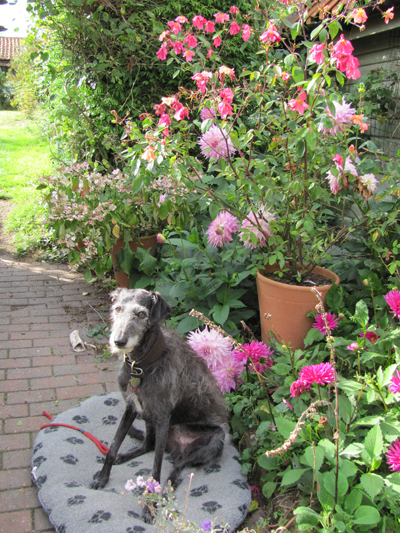 at last we are having a short period of indian summer. 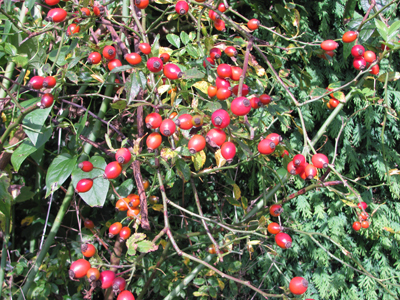 the rosehips on the dog roses are more decorative than anything else in the garden at the moment. they will provide food for some creatures; when the contents were stored under tarpaulins the autumn the sheds were rebuilt, I found chewed up rosehips inserted between boxes and under the tarps everywhere. they are glowing red, taking over from the honeysuckle berries which the bullfinches have been taking for two or three weeks now. I have never seen them before; they are very shy, but perhaps the bad weather which kept us indoors encouraged them to come into the garden. I heard their distinctive flutey calls around the village several times. it is not so long since they were routinely killed for taking apple blossom; although I don’t remember them in our orchard as a child, my cousin has a distinct memory of her father shooting them out of the bedroom window. 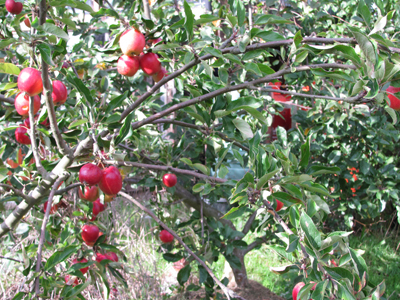 another fantastic crop of apples is ripening. they are not quite ready yet, about two more weeks I think, and then I will be overwhelmed with them. 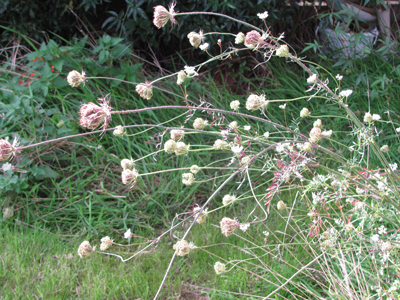 I am pleased to see the wild carrot back in the corner by the sheds; they self seed and are spreading. 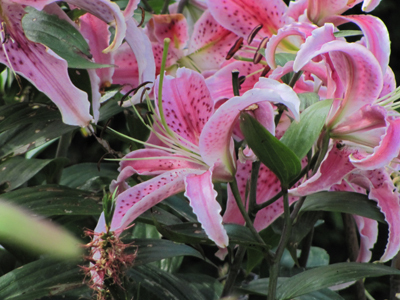 a very graceful plant and useful for decoration. 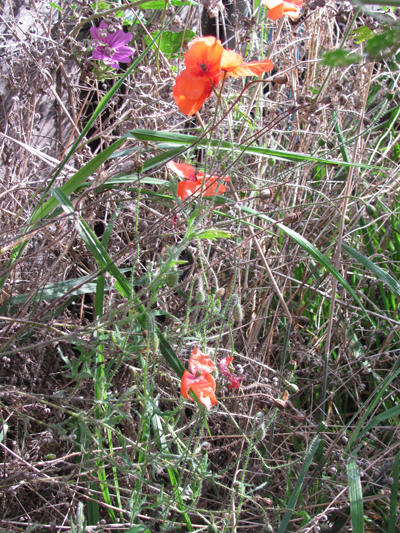 the very last of the poppies – all the rest have been cut down, as I have worked hard to revitalise the grasses by cutting all the yarrow, poppy and knapweed back, and will keep rotor-scything until the growth stops. I want to try to seed cornflowers into the bare patches this autumn. he had found a good place to absorb the warmth and stayed while I tried to get a close-up. this camera seems to get confused and took several very blurred photos. out on the farm the stubbles have an undergrowth of grass and weed – they are not very pretty. we disturbed half grown roe twins in the long grass, they got up and then froze for ten seconds, and the dogs didn’t see them, then as I fished out my camera, of course they started to bolt, Sal rushed after them, Tilda pulled on the lead and all I got was blurry pictures of the grass.their ears were enormous – such pretty creatures. Sal’s rushing is of course very ineffectual, it just incites Tilda to protest. 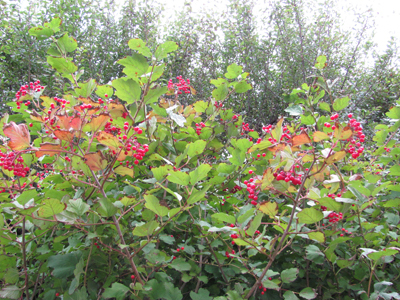 bright guelder rose berries in the green lane. 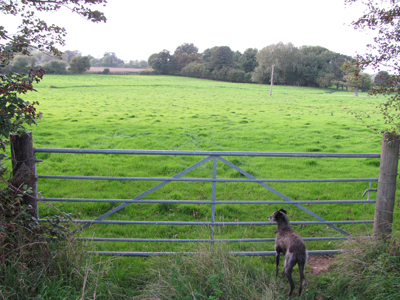 the big pasture is bright green and has no sheep on it – I wonder if they will come back this autumn, there seems a fair bit of feed. 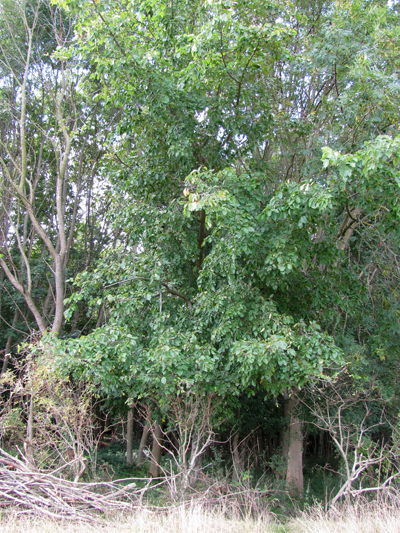 the East Anglian Elm, the narrow leaved elm, Ulmus minor, or carpinifolia, the smooth-leaved elm; it has many names, and almost every village or wood a slightly different variety, but sadly nowadays you are more likely to see dead trees than living, or at most young sucker growths. 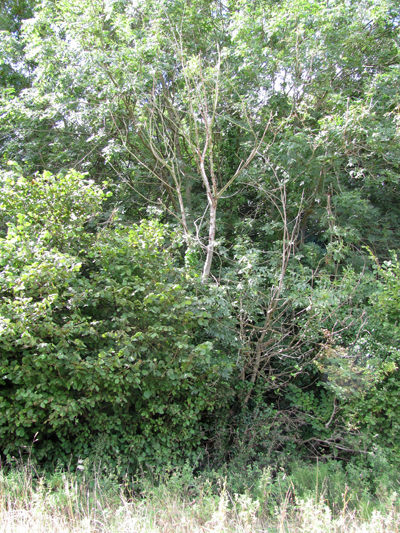 the latest, most virulent episode of Dutch Elm disease started in the south west in the 60’s and progressed across England over the next twenty years, so that now we have almost forgotten what the landscape looked like with big elm trees. in the 90’s another wave of the disease arrived; the survivors are mostly small trees, suckers growing up from the roots of the dead trees, which are hit in their turn by a new outbreak. there is a corner of Bale wood where they survive, growing to a certain size, until the beetle introduces the deadly fungus which will kill in a year. 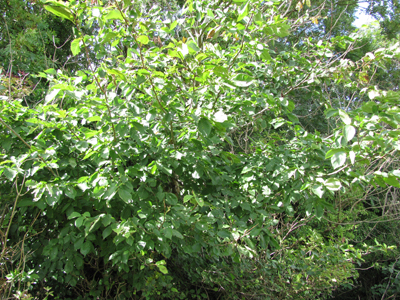 Elm trees rarely propagate by seed, so they can only spread gradually from an original tree by suckering, but in time can invade a wood. here they die, regenerate, and die again, but never completely. eventually the fungus seems to burn itself out, perhaps attacked in its turn by a virus. though its top looks a little thin. 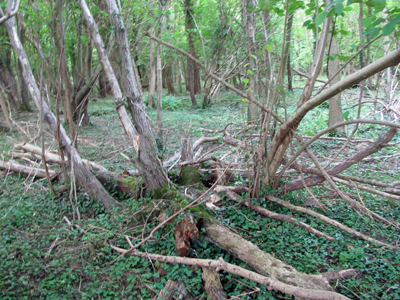 a group of dead clones collapsed on the woodland floor, opening up a clearing. everywhere dead trees lean and sprawl amongst the living. 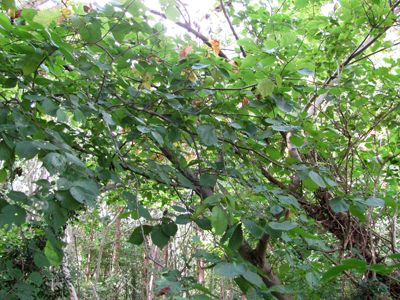 this part of the wood seems to have an equal distribution of elm and ash, with a few hazel, sycamore and pine amongst them. there are patches of primrose and violets grow with ground ivy all over in the spring. outside, on the border of the field there seem to be the remnants of a hedge; elder have mostly died but there are blackthorn and hawthorn and bramble. there is also a marked browse line. I have come across roe deer feeding here. 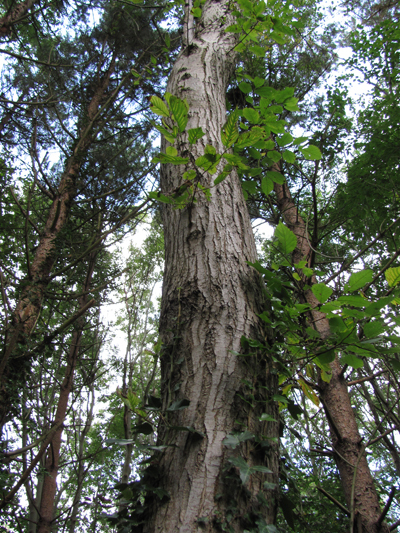 one fairly big Ulmus minor growing on the edge of the wood. 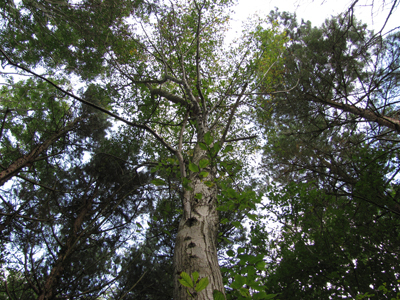 elms have suffered from outbreaks of this beetle-born disease through history. documentary and tree ring evidence shows a mysterious death of elms from 1819 until the 1860’s, and probably in the 1500’s. 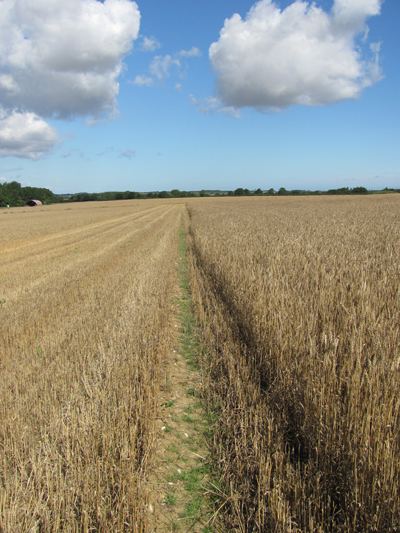 Oliver Rackham (the History of the Countryside, latest edition 2000, pages 243 – 246) proposes that the prehistoric Elm Decline, which occurred at about 5,000 to 5,500 years ago, around about when early agriculture arrived, was caused by the disease rather than man’s interference. pollen deposits show how after the ice sheets melted, woodland reasserted itself across Britain rapidly between 9,000 and 7,000 years ago. at first birch, aspen and sallow replaced the grasses and heathers of the immediate post-glacial tundras and moorlands, then pine and hazel, followed by oak and alder, next mostly in the south, lime and elm, then holly, ash, and the last to arrive , beech, hornbeam and maple. 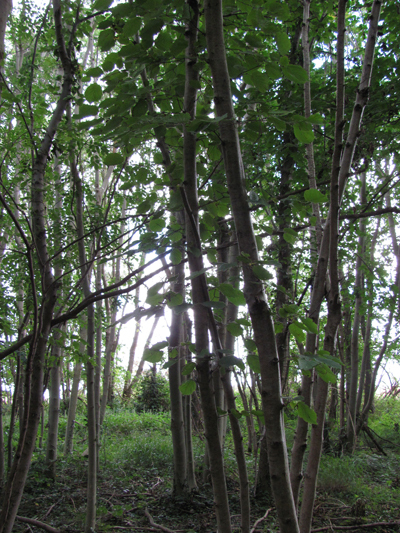 between 7,000 and 4,500 years ago climax wildwood types adapted to climate and soil; in Norfolk there were at least seven local types, including limewood, ashwood and elmwood. 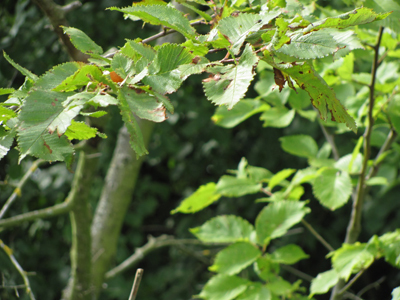 Native elms include Wych Elm and the East Anglian Elm, found in the pollen profile (Bennet, K.D. 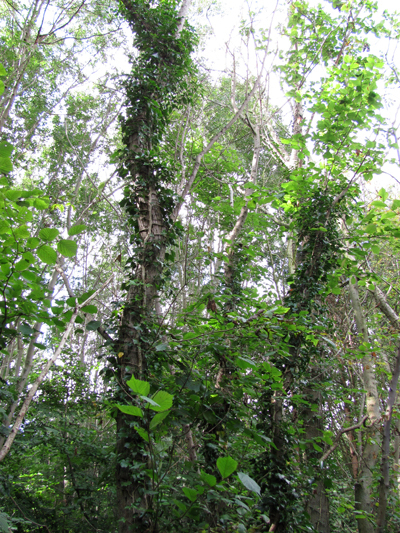 ‘Devensian Late-Glacial and Flandrian vegetational history at Hockham Mere, Norfolk, England’ New Phytologist 95 (1983) 457-487), but not the English Elm, a later arrival, possibly introduced by humans, or a hybrid of the earlier two types. 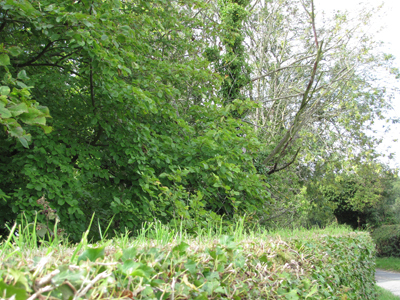 more elms can be seen in Clip Street, behind an old flint wall which encloses the remnants of an orchard with two huge walnut trees and a mature lime. 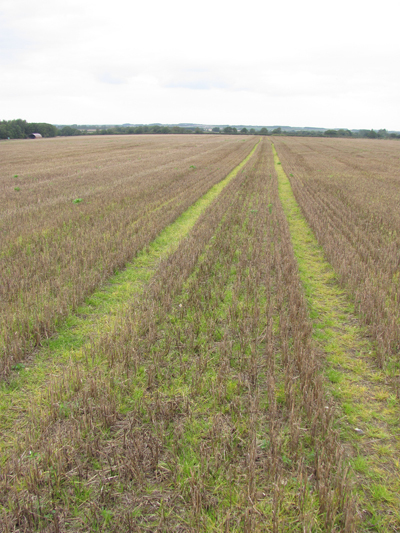 this is where the electricity cable from the North Sea wind farms is proposed to be laid. if so we will lose all these beautiful trees. it turns out I was one of three potters in the Hart Gallery’s Summer show, with some work they have had for about a year. it was interesting to look again at what they have. 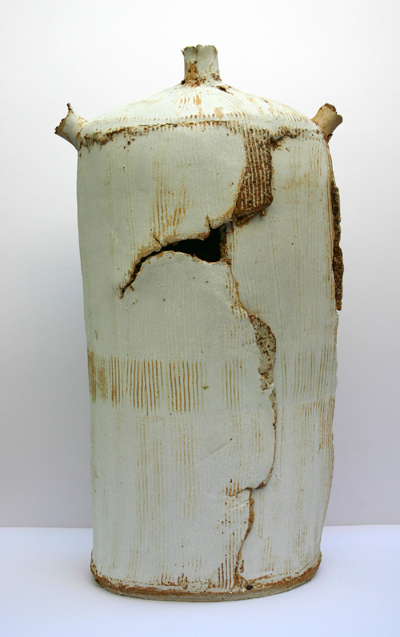 they have this one as the main piece for me in their website – in fact it was sold a while ago! but I like it and it makes me think about using this horrid poisonous barium carbonate glaze again. other artists shown include this painter, Lewis Noble – I like his work very much. I am proceeding at snail’s pace making more work. 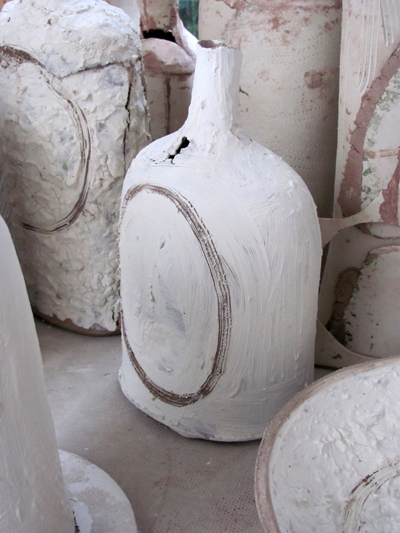 I have quite few of these bottles made, which are slipped with porcelain. 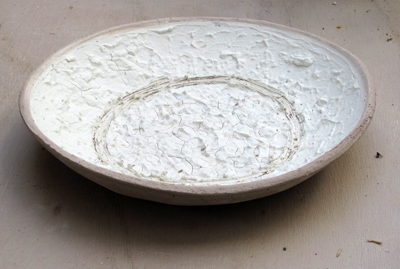 it’s just the leftovers from slabbing with porcelain kept in a bowl with a lot of water, mostly roughly brushed on. some experimentation with clay as a stencil, and then leaving the stencil on and brushing more porcelain over it. I am using clay that’s still quite fluid to build with and then there is a temptation to push it about a bit, which I easily give in to. 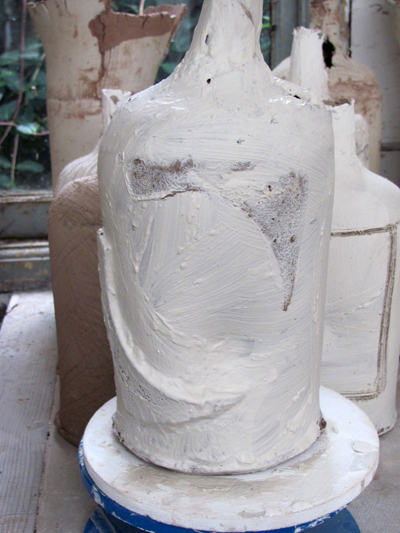 my plan is to carry on making for a while before firing anything. the porcelain has been squished onto this dish, so thickly that it has a lumpy and cracked texture. finding the right glaze to complement it will be difficult. 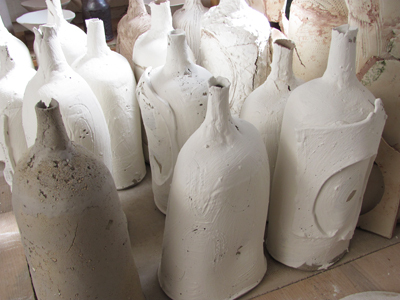 and here is the main group of bottles, with sgraffito, applied clay, stencils, over-slipped scratched squiggles and more. you can see how I have pushed the soft clay to make inward bulges, and all are slapped about a bit to give them soft rounded shoulders. the clay is mostly a cheap stoneware buff I am trying out. 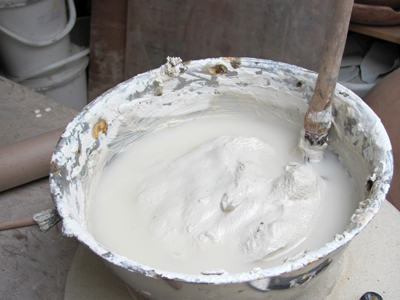 it’s called “school clay”. we’ll see. a new camera to start off a new stage of the blog. I am on wordpress 3.0.1 now, and it’s a little strange to begin with. the camera is a canon powershot SX 120 with ten times optical zoom. it does have a bit of a problem focusing on close up with the zoom , even in macro mode, so I end up missing butterflies or just getting totally unfocused blobs until I back off with the zoom a little. there’s an easy video clip recorder I have been having fun with, and mostly I think the photos have a clearer quality. 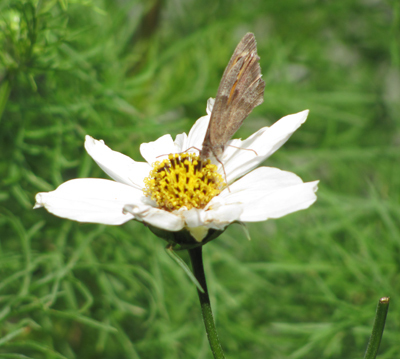 this looks like a meadow brown sampling the cosmos. 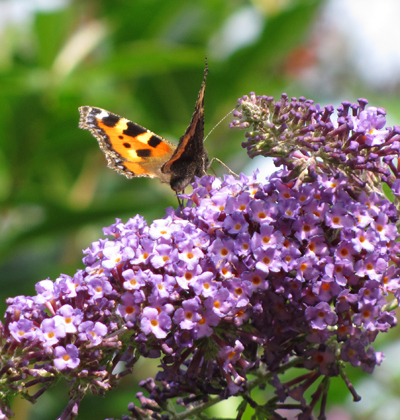 these few days of superlative calm and blue skies after the rain and winds of August have encouraged a few butterflies out. 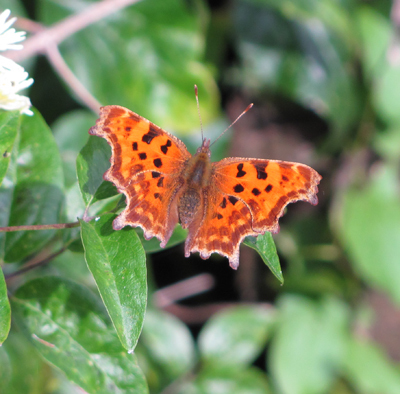 this summer, although there have been plenty of large whites, small coppers, common and holly blues, and meadow browns, the big hibernating butterflies have been missing. there was no influx of painted ladies either; I saw one ten days ago when the weather warmed up over the penultimate weekend of August, none before or since. 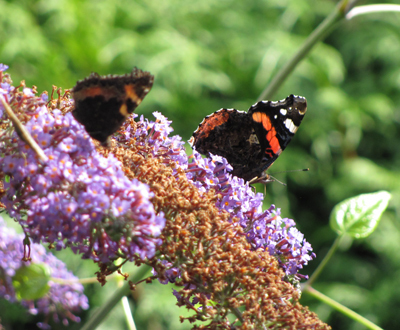 a couple of red admirals appeared at that point and have reappeared with the good weather, accompanied by more. 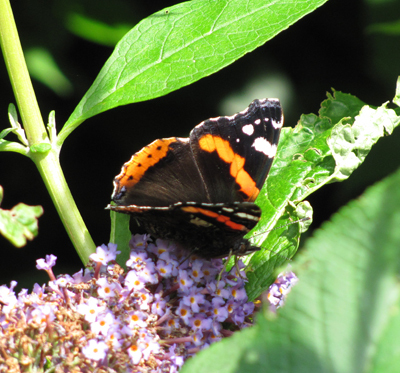 this red admiral must have been newly emerged, it was so perfect, the fur on its body all glossy, and it spent about ten minutes on the flower, completely undisturbed by my photographing it. they are still feeding on the buddhlias. 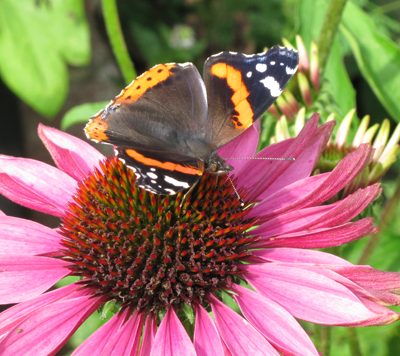 the echinacea, which was very popular, is over, but they are also attracted to the rotting plums out of reach on the tree or windfallen in the grass. 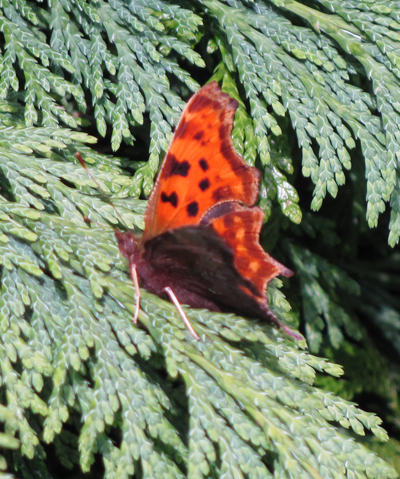 there was a small tortoiseshell yesterday and today a single peacock was back, now seen twice in my garden this year. 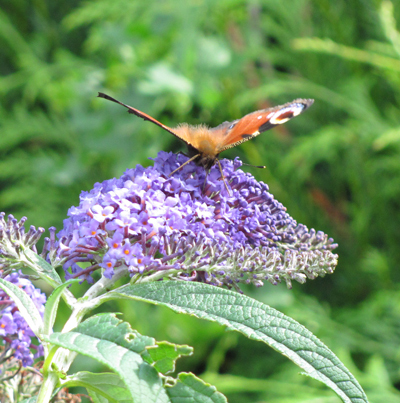 friends have reported hummingbird moths in their gardens, I am most envious. all through June and July when my wild flower and meadow garden was full of knapweed and other suitable flowers, there were plenty of wild bees feeding, but no butterflies to speak of. 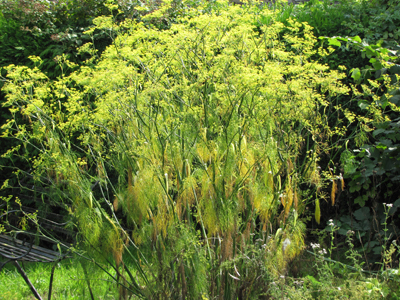 the big fennel plant in my garden, gathering the autumn sunlight to itself as it begins to ripen and fall. during the last wet and windy week a bullfinch appeared on my honeysuckle, eating the berries. a beautiful bird, its deep rose chest and blue-grey head and wings making it immediately obvious. I don’t think I remember seeing one before, and certainly not in my garden. 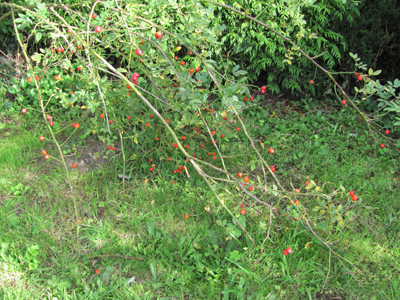 I had been told that there were some in an old orchard in Clip Street last year. then a female arrived a week later; there are perhaps a pair around, but they are shy birds. I had tree sparrows visiting my feeder two winters running; another attractive bird with their chestnut heads and black cheek spots, but the return of house sparrows seemed to put them off and I haven’t seen them for about four years. I have stopped feeding seed to garden birds, as however careful one is about the feeder itself, the ground below, where much edible debris falls, cannot be disinfected and trichomoniasis (a parasite which grows in the throat and prevents food passing through. it is passed on by birds feeding their young and males feeding their partners) was affecting the greenfinches and chaffinches. since I started feeding peanuts I have not had this problem, although they are not as popular as the feeder seed mixtures.